Hacienda Wine Cellars is a former winery once owned by Frank Bartholomew, that was located in Sonoma, California, United States. 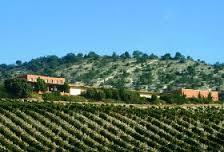 Hacienda was founded in 1973 after Bartholomew sold his ownership of Buena Vista Winery in 1968. After the sale, he retained the majority of his original vineyard land, and proceeded to acquire a former hospital located near the vineyard land and developed it into a winery. By 1977, it was operated by A. Crawford Cooley, producing 25,000 cases a year. JFJ Bronco purchased Hacienda by 1992, as well as Hacienda's sister label, Antares.